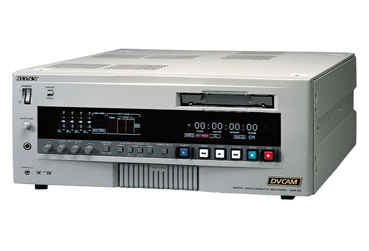 DSR85 is the first high-speed editing VTR with the capability of four times video and audio digital data transfer through the SDTI (QSDI) interface. Designed for studio-quality broadcast and editing applications, it features full editing functions such as built-in TBC, TC generator/reader and RS-422A IF. In addition, it offers DV playback compatibility, up to three hours recording, four channel audio capability, dual cassette mechanism, ClipLink operation support, full analog/digital, video/audio IF, jog audio, digital slow, Control S input and self-diagnostics. Has a full complement of digital and analog interfaces.